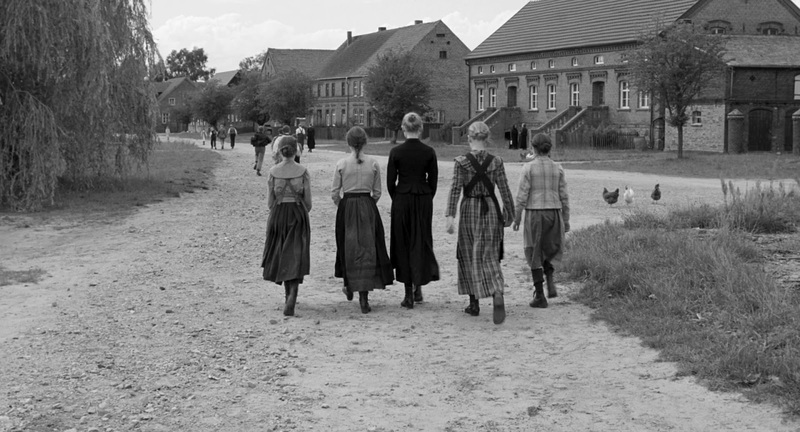 The White Ribbon is a film written and directed by Austrian director Michael Haneke. 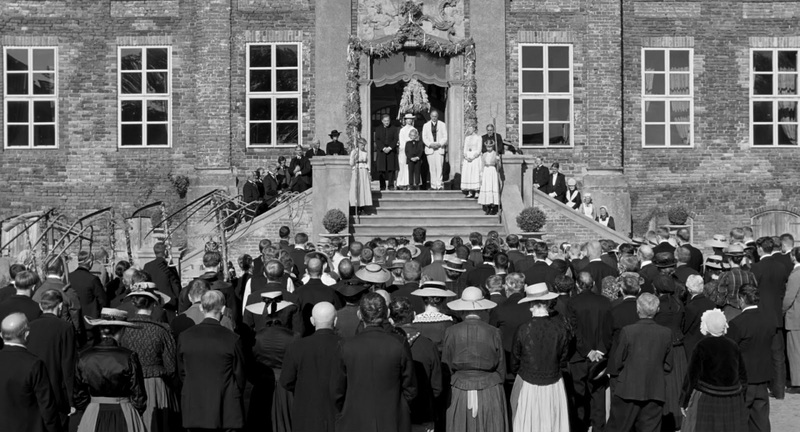 It premiered at the 2009 Cannes Film Festival, winning the Palme d'Or in addition to the FIPRESCI prize, and a special mention from the Ecumenical Jury. 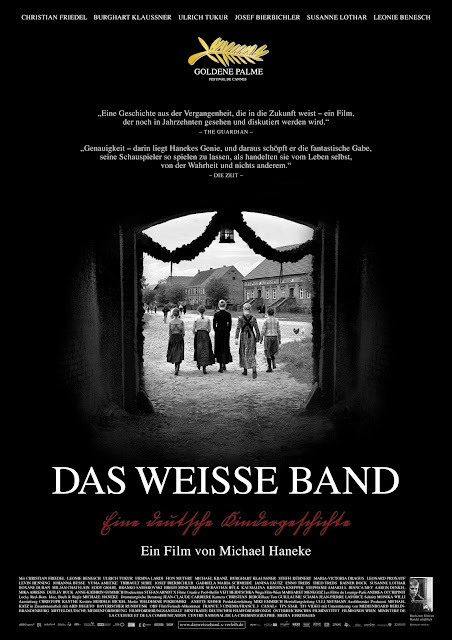 Focused on the children of a small German village in the months leading up to the First World War; in the director's own words, The White Ribbon, is 'a film about the origins of all forms of terrorism'. 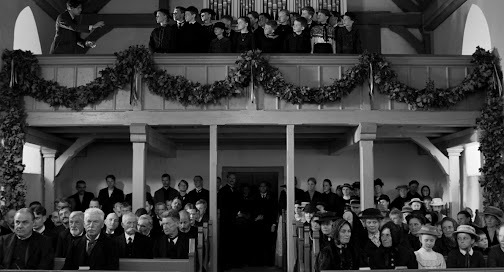 A case he compellingly makes with a stylish black and white camera, and a well woven screenplay that thoroughly immerses the audience in the meticulously detailed people and scenery, while maintaining a careful impartial distance. The film is presented in a way that feels like a mystery thriller. As a series of strange and bizarre events unfold, we witness the effect they had on the entire village. As told through the probably unreliable recollection of the town's schoolteacher (voiced by Ernst Jacobi, and played by Christian Friedel) many years after the events occurred. Having seen most of his work, I've always considered Haneke to be a remarkably skilled director, but never has he shown such a complete and refined display of film craft as he does here. 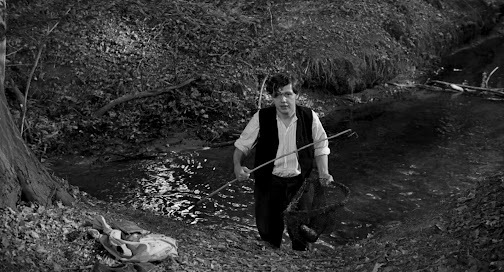 At the heart of the film is the eerie tone generated by the elegant black and white camera work of Christian Berger. 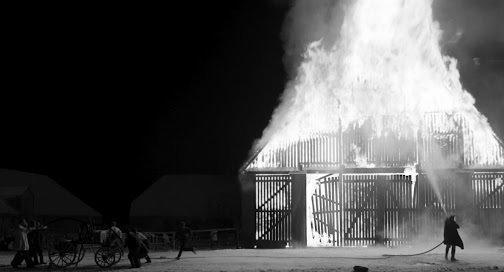 Every shot is precision placed for full aesthetic and cinematic effect, and frequently held for what normally would be considered an unnecessary amount of time, but here, whether it be a wintry landscape, a winding path, or a closed doorway, the long silences serve to enhance the film's pervasive sinister feeling. Silences that are further intensified by the total lack of external music, not even in the opening or closing credits. He also has firm control of his actors. Coaching astonishing performances from the entire ensemble. Every one of them a richly detailed character and all so perfectly cast. Especially the children. 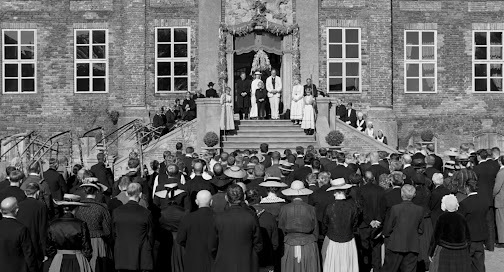 There's the unsettling simultaneous look of innocence and evil in the faces and demeanor of Martin (Leonard Proxauf) and Klara (Maria-Victoria Dragus), the Pastor's two eldest who are forced to wear the titular white ribbons in an effort to keep them pure. The adorable shyness of young nanny Eva (Leonie Benesch), in her awkward interactions with the teacher. The inquisitive five year old Rudolf (Miljan Chatelain), who —in the film's most delicately powerful sequence—is taught the concept of death by his quiet and emotionally damaged older sister Anna (Roxane Duran). Tying together the visuals and acting is a complex screenplay that represents Haneke's heightened mastery of storytelling. One which gives us a full portrait, taking the time to follow every significant household and family member of this outwardly normal village. A simple and peaceful place suddenly plagued by seemingly random acts of malice. Though instead of the in your face displays of violence and brutality that he has opted for in past films, here the director exercises a genius amount of restraint. Aside from the opening scene where the doctor (Rainer Bock) is seriously injured when his horse is brought down by a tripwire strung across his yard, all the other incidents occur off-camera or behind closed doors. He also plays with the audiences expectations, slowly building a structured mystery that isn't meant to be solved only contemplated. 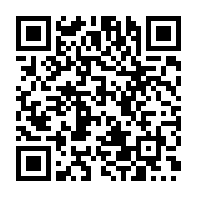 Yet leaving behind just enough clues to offer a reasonable explanation. There is a fine line of ambiguity or clever trickery that will leave your viewers either satisfied or frustrated. As well as knowing what details are important and just how to reveal them; and in my mind, he has struck that balance perfectly here. While I don't entirely agree with Haneke's assertion on how terrorists are made, that takes nothing away from my impression of the film. The White Ribbon is a triumphant accomplishment of nuanced atmosphere and thoughtful storytelling. A controlled display of prowess from one of the world's most important and provocative living filmmakers. A modern masterpiece. Michael Haneke is in my eyes the best living director in the world. No director still working makes films that I respond to as personally as Haneke. For my money, his 2000 film Code Unknown is one of the most important movies ever made. Few films speak to me as personally as that one. I love The White Ribbon. I think it's a great, really engrossing period drama with fantastic attention to detail, rich cinematography, excellent acting and concise, brilliant direction. Haneke is a master of his craft. I loved this film. Some of the characters reminded me of Ingmar Bergman, thinking especially about the evil priest in Fanny & Alexander. Surely there must be some influnece there? I thought like you that this was a very good little "mystery" film in itself. I'm not all convinced about that part about how this explains the laer growth of nazism. But that connection isn't needed anyway; it's a brililant movie as it is. What a great and favorable review. The film must be good if you praise it that much. I have wanted to watch it since 2009 but I never happened to stumble on it. However, I definitely will! I don't often say that but I think this is a masterpiece. Watching this film I thought I was watching a mix blend of a Dreyer film like Ordet or a Bergman film like Winter Light. A great film all in restreint like you said. To me this is the kind of film you know it's gonna age well and it felt near perfection. I just watched this last week and am preparing a review for it myself. It is everything you say - although being a Fereudian I agree with him that this is how terrorism is formed. I loved the representation of the children here. You hvae highlighted it really well in your review - that mix of purity and the underlying powerlessness that is fuelling subconscious revenge is shocking. I saw this after Amour because I was so impressed with that film. I really love all Hanekes films, but I do think he gets better as he goes on. Great review of a great film BT. Nicely reviewed. I found this to be a powerful film, one that stayed with me for a long time after I viewed it. It's a film that seems to be either/or; a lot of people I know who have seen it have really disliked it. Like you, I'm not sure I buy the whole premise, but it's certainly an interesting thought. Yeah, Haneke is up there for me too, and I agree he has the greatest mastery and control of the craft right now, but I would still rank Herzog, Wenders, Claire Denis, and the Dardenne brothers higher on a purely personal level. 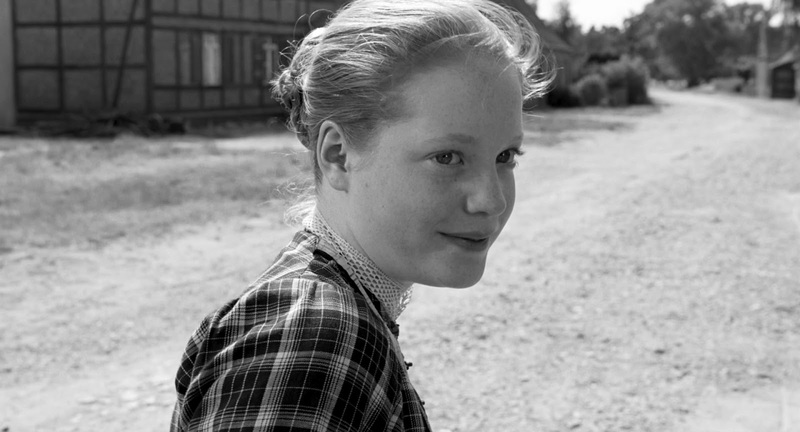 I can see the Bergman influence more in the cinematography than the characters, it reminded me a lot of The Virgin Spring. I actually found the priest to be almost too archetypical. At this point it would be refreshing to see a good priest once in awhile. It is an exceptional film, even if I don't agree with its message. It's rare that I ever watch a recent film that I rank and recommend so highly. Yeah that is a word I seldom use as well. But every aspect of this was so well done, I knew it was an instant classic the first time I saw it. This was my third viewing (that says a lot too because I seldom re-watch new films), and it hasn't lost any of its power. In fact I seem to always find new subtleties that I missed before. Yeah, I love this film, and oddly enough I wouldn't call it a favorite, probably not even top 20 of the last 10 years, but I think it's the most technically and artistically complete film of the last decade. In simple terms I guess you can say that oppression causes terrorists or rebels. But there are just so many other external factors other than parenthood or religion, that it seems too convenient to explain it this way. I do entirely agree that Haneke has continually improved over time, and I'm glad that he seems to have gotten over his tendency to show disdain towards his audience. It is so chilling. Those children's faces are so haunting that it does stay with you for quite awhile. I can also see why some might not like it. It is a challenging film, longer than most, and offering up a grim view of humanity without anything resembling a spoon fed resolution. For reasons even more complex than how the Nazis came about, most audiences today expect easy answers wrapped up in a fireworks display. I was left thinking about this one for a long time. I haven't attempted to review it because I still wouldn't know what to say. 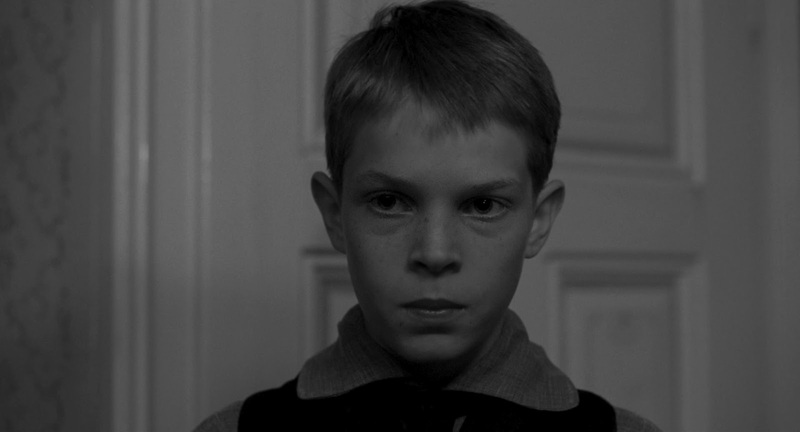 The performances of the children are, as you say, incredibly unsettling. That scene you mention with Rudolf and Anna really got to me. Superb review. I know what you mean, there are several films that I want to review but don't yet have the skills or experience to adequately put them down in words. But, that scene. Such a heartbreaking end of innocence, it gets to me every time. I only hope that the actor was already old enough to understand that dialog beforehand. I'm intrigued.. to say the least. I don't know, without a big name, with a slightly differently edited trailer, I don't know how interested in this I'd be. Between the review and my already half unsettled thoughts, however, I'm thinking I'll have to give this one a view. I'll just make sure the mood is right first. I think it works much better without any recognizable faces. It helps you believe this little place could and did exist. But I can understand why you'd be apprehensive about it, it's definitely not a happy fun time watch. Yeah, on a purely emotional level this one affected me the most as well. The others affect me too, but in other ways. I think unlike some directors who I suspect leave holes because they can't think of a good way to end things, I believe Haneke does know exactly what he's doing and I agree with his reluctance to give up the easy answers.